Every now and then, you happen upon a movie that really resonates with you. Sideways is such a film for me. There is a lot of myself that I see in Paul Giamatti‘s Miles, just as there’s tons of a certain friend of mine in the Jack character played by Thomas Haden Church. 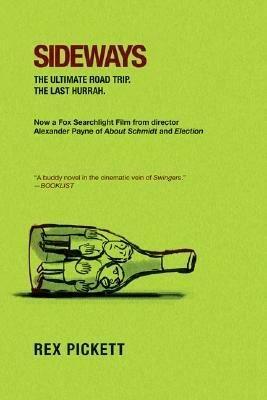 The tale of these two buddies embarking on a road trip through California’s wine county before Jack’s getting hitched is a funny one to be sure, but also very insightful and honest. It’s one of those movies I can watch time and time again and still be entertained. The Rex Pickett novel it’s based on was an interesting read for a big fan of the film like myself. While the overall story arc remains the same, the set pieces and individual events often vary wildly. In particular, the two friends’ interactions with Maya and Tera (who oddly became Stephanie in the film) will provide some surprises for anyone who reads the novel after having gotten familiar with its adaptation. That’s certainly not all of it, though. The book takes more time to develope the bond between Miles and Jack, including a number of parts where the women are nowhere to be seen (including a very memorable boar-hunting episode). A bit more emphasis is put on the fact that the trip is something of an end-of-an-era for the two, as they’re both aware that they won’t have any chance to embark on week-long trips with just the two of them once Jack enters matrimony. There’s more melancholy to be had inbetween the comedy in the book’s pages. The story in the novel is told from Miles’ perspective, and it shows. Since he’s a writer, an intellectual and a snob, Miles takes great delight in using big fancy words almost provocatively, both in and out of dialogue. If I were to follow countless English teacher’s suggestion to always underline and look up words I don’t quite understand, my copy of Sideways would look a mess. It’s all good, though. Most of the time it doesn’t matter as much what the word means as the fact that Miles uses the word does. There is also naturally a lot of talking about wines, the beverages often so vividly described that I almost feel like getting into the hobby myself (not that I will). Perhaps what surprised me most was realizing how much of the movie is original. Some of the big important scenes of the film are either not in the novel at all or drastically different. Biggest example might be the conversation between Miles and Maya on the patio where they indirectly talk about themselves in terms of grapes, a discussion that is nowhere to be found in the book. A lot of the film’s best jokes and gags are its own as well. The chewing gum scene, for instance, and the faked traffic accident is different enough to warrant mention here as well. Director Alexander Payne and his writing partner Jim Taylor have done a superb job of altering things while still keeping true to the tone of the novel. All these differences between the book and the movie means that they’re both worth experiencing. You’ll recognize the characters and the story, but you’ll get to see an alternate version of the events taking place, with new dialogue and fresh laughs. I do like the movie better. Maybe it’s because I saw it before reading the book, but a lot of things just seem to work better in visual form. Reading about Miles walking in on Jack mid-coitus or about Jack chasing after some golfers while swinging his club around is funny, but it can’t compare to actually seeing it happen on the screen. And then there’s the great performances from the four main players, with Giamatti in particular being perfectly cast. It’s a wonderful story to behold no matter which medium you choose, but it holds up well enough to warrant a double-dip. I saw the film first and fell in love with it, then later read the novel and loved it, too. I recalled some passages in the novel not being in the film and some being different, but I never felt it was as pronounced a difference as you characterize it here. I would have loved to have seen that boar hunt in the film, though I can appreciate why it and that character were excised for the sake of brevity. What struck me most about the novel was that the two women are not the hapless victims that their cinematic counterparts are. It’s a far more amoral dynamic between the four literary characters, and I found that a little more interesting than the more pronounced “men bad/women good” approach of the film. Though, again, I can appreciate why this was changed; a film cannot suggest the kinds of nuances and interior thoughts that a novel can explore. I don’t know if you’ve seen it, but the “Sideways” movie website (still up last I checked) includes a map of the events in the story, most of which were the same in both novel and film. I found it interesting to get that kind of feel for the geography of the thing. By the way, if you found Miles verbose, check out the DVD commentary track between Giamatti and Church. It’s a gem of a commentary, but even I blinked at a couple of their exchanges, and I was literally called a “human dictionary” by my classmates as a kid. Yeah, I really should have gone more into the differences in how the women were portrayed. It is as you say: less simple than in the movie. I found it a bit odd that they’d change Tera to Stephanie when all the other characters kept their original names. Sandra Oh also seemed an odd choice for the character the novel described, certainly in terms of appearance but also the character type. Then I realized that she was married to Alexander Payne at the time. I try not to be cynical about these things, but I really have to assume that had something to do with her casting. She did a fine job in the film though, so it doesn’t matter much. I’ve heard great things about the commentary track on the DVD and was very eager to check it out. Unfortunately, somebody screwed something up for the Swedish DVD release. The cover boasts that it has the commentary track, but there is no way to access it on the DVD. Either it’s a misprint on the cover or a manufacturing error. It’s really annoying either way. I love a good commentary track. I recall seeing that blog post of yours a while ago. I dig the idea, and was actually a bit surprised that there wasn’t more music in the novel. It felt like it was, somehow. I still haven’t learned of the reason for changing Tera to Stephanie. Regardless, I really liked Sandra Oh in the role. She contrasted very nicely with Virginia Madsen in much the same way that Giamatti contrasts with Church. Even having read the source material, I have a hard time imagining anyone else in the role. I think maybe the reason you felt there was more music to the novel than there was is because most of the passages only mention a specific song or even something vague like, “classic rock song” playing on the speakers at the diner. It’s clearly implied that much more music is being heard by the characters, but it’s not identified to us as readers. So when you’re reading about the foursome hanging out at Maya’s place, you’re informed that a Tom Jones record is playing, and subconsciously you’re already pacing that exchange between Miles and Maya against the 15 minutes you know make up one side of an LP. Currently, I’m still compiling the music I need to finish off the playlist based on Diablo Cody’s memoir, “Candy Girl.” After I’ve finished that little project, I’ll begin the daunting task of going through “American Psycho.” That will be quite lengthy, as you well know! 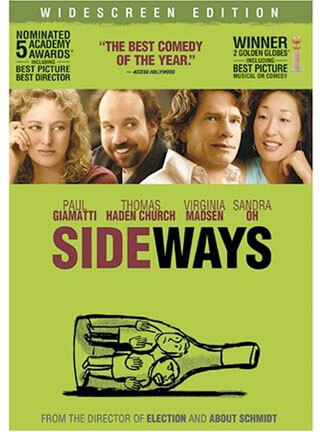 By the way, have you seen the Japanese version of “Sideways?” I’m aware of it, but haven’t seen it. Also, Rex Pickett has a sequel novel! I found out about it during winter, but it seems to have been delayed. I forgot all about it until just now. Definitely looking forward to that! As I was reading the book, I very much pictured Miles, Jack and Maya as Giamatti, Church and Madsen. Tera took on a life of her own though. I can’t say I ever saw her as Sandra Oh while reading through it. Just checked on the Swedish Blu-Ray release, and it doesn’t seem to have the commentary track either. I might end up importing it once I feel the need to update my DVD library to HD, but I think that’s still far off in the future. Sideways isn’t a movie for which Blu-Ray seems essential. We’ll see. Oh God, compiling a soundtrack for American Pscyho sounds like a very rough job. Best of luck to you on that one. Great book, fortunately. How is Candy Girl, by the way? I’ve been meaning to check that one out at some point. I’ve read a bit about the Japanese remake, aye. Haven’t heard anyone say it’s something one needs to see, but I reckon it might be worth it to see what alterations they’d make to account for cultural differences. Giamatti turned down the offer to make a cameo, apparently, and seemed less than pleased with the entire idea. I did not know about a sequel novel, though. That’s interesting! I wonder what it’ll be about. I could easily see Jack’s marriage crashing and burning, but I wonder how Miles ended up. Definitely something I’ll have to keep my eyes on. Thanks for bringing it to my attention! I still haven’t gotten around to upgrading “Sideways” to Blu-ray, but with all the exterior landscape shots I suspect it’s gorgeous. It seems that most people who haven’t adopted Blu-ray are under the impression that only big effects movies are worthy of the format. Our first Blu-ray Disc was “Star Trek,” which is absolutely beautiful to watch in HD. That was just weeks before Thanksgiving, though, and our fourth and fifth Blu-ray purchases were “The Departed” and “Wedding Crashers.” I was stunned at how much difference it made watching those two in HD. There’s a shot in “The Departed” where you can read the serial number off the dollar bill Jack Nicholson is holding. After watching stuff in HD, you begin to realize it’s not about seeing intricate details, but seeing more clearly what was filmed regardless of what that may be. Here in the States, we have allergy medication commercials that demonstrate the effect of their product by showing footage in a dull, hazy way and then showing it clear and vibrant. I assume you’ve seen ads like it. That’s really what it’s like watching in HD. Our satellite TV service isn’t in HD, and after we’ve watched a Blu-ray Disc, our TV programming just looks awful. So don’t think of it as a movie detail thing nearly as much as an “I can see clearly” thing. Oh, I agree that HD makes all films look better. After getting my PS3, I’ve been borrowing some Blu-Rays from a friend, and it’s certainly an improvement. Star Trek is indeed a good example as it looks quite stunning on BR. However, I don’t have that big of a TV screen, so the effect often isn’t as pronounced as it could be (compared to when I’ve watched HD films elsewhere). It’s mostly a cost thing for me. Blu-Ray movies are still somewhat pricey here, so I’m much more likely to spring for the DVD when available. The difference in quality for me at the moment isn’t enough to justify the extra cost. I know a few years has gone by since above entries… yet Your being a Swede – what about a review of another favorite film of mine as well… A Man Calld Over :) !!! LOVED IT as well as Sideways !! An interesting thing happened on my way of watching Sideways Theatrical production.. which was done…. at….. Airport hanger. with about 40 people showing up – with some very distinguished (looking) HOllywood older couples… who got all front seats :)..
What made the event MORE intersting… Rex P himself was THERE !! :).. So I shake his hand.. almost feeling like hugging him… until…. I compliment him… ” A Day after Yesterday ‘ – Miles’s book that wasnt published… when Maya’s says… You mean ‘TODAY’… With Miles puzzling face, i.e. in writing all 600 pages.. never did he once thought that title actually meant that :)… I thought it was hilarious… So I compliment REx about that… on which… now Rex’s face becomes puzzled.. like MIles’s in the film :)…. after which Rex tells me.. that it was NOT a part of the book.. :((((( So it was Alex’s Payne idea I suppose ? Is Miles’s & Jack’s exchange on the regular DVD ? Would You know ? I will search mine… and hopefully will find it…. I do remember when once looking at extra DVD material… there was a cut out epizode where Miles and Jack are driving somewhere and they injur a dog on the road :(((… I believe it was limping afterwards.. so not injused too badly.. It added an emotional spin on things.. obviously.. yet probably wasn’t as visible or importnant enough so was left out. Thanks for having a blog such as this – much appreciated !